Dealer stands on all 17s in wagerworks 21 + 3 Blackjack. You may double down, even after a split or re-split. Re-splitting is allowed once per split card. 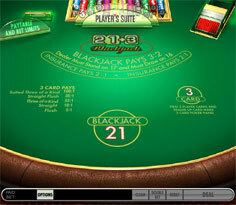 Split aces are treated like any other split card, but Blackjack is not possible on Split cards. Any eight-card player hand that is not Bust will beat all dealer hands except for dealer blackjack. Additional rules apply to the 3 Card Side Bet – the two player up cards and the one dealer up card can produce extra wins if they form a special hand, as outlined below under Wagers and Payouts. This game plays as smooth as can be. The buttons are easy to find and out of the way, leaving the whole playing area clear so that you can focus on your game. The cards are bold and very readable. The graphics are descent, though the table is blue instead of the traditional green. Subtle animations add a nice touch to card movements, chip actions, and other parts of the game. Overall, it looks quite good, and plays very well. The 3 Card Side Bet is what makes this game unique, turning the first 3 up cards of a hand into a 3 card poker hand that can help you win big. But remember, while the proper clackjack portion of this game involves a mix of luck and skill, this side bet is based purely on luck. You’ll lose more often than you win, but when you win, the payouts are great! We all love a good game of Classic Blackjack. Many of us are poker fans too. So when this game first came out, many of us were excited to try it. 21 + 3 Blackjack definitely does not disappoint! It adds a little thrill to the deal, and a chance to win some extra cash, but then once you’ve won or lost you can focus on blackjack – it’s the ideal side bet scheme that doesn’t get in the way of the game!